Hi, everyone! Yay, it’s Friday! I’ll be busy with Father’s Day weekend goings-on. Have you guys tried making those steam pots that have corn on the cob, potatoes, sausage, and seafood in them? I’m going to attempt that on Sunday for my baby daddy. 😛So, it’s the final day of flashback week. Because of a mishap, only 2 polishes were able to be swatched this week, so I’ll still try to give you some fresh stuff next week! On to the mani! This is actually a recreation of a mani I had done some years before that looked pretty hideous to my now better-trained eyes. I love grey polish and I love pink and grey together, so I figured a reboot was meant to be. I started out with Show Steel-er (me from 2 years ago didn’t note how many coats- for shame! ), then taped it off and painted on Pink Blink. When they were dry, I added pearls and steel balls, both from Born Pretty. If you’re interested in getting some nail art doodads from BP, you can use my code- LESLIEW10 for 10% off of your order on regular priced merchandise. How about another shot of this one? Please forgive the crummy picture quality. Besides that, I like the way these turned out. And my nails! They’re long (for me)! Hahahaha Well, I hope you all like this and thanks for visiting the blog! I love how simple this is. I know that sometimes it’s hard to show restraint, but this is perfect! Lol, YES! I always want to add everything and the kitchen sink! Love it! 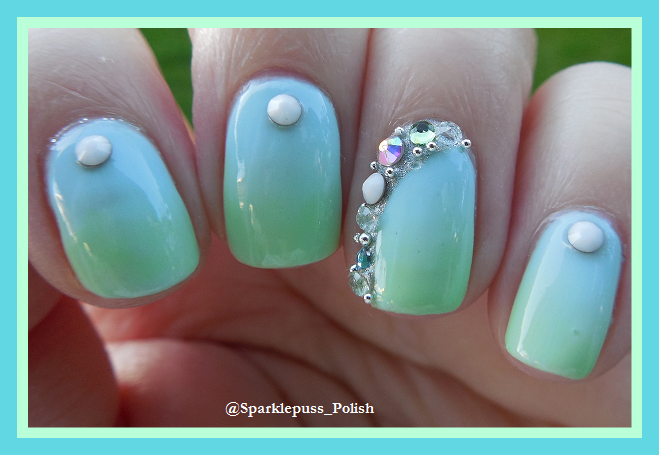 The little pearls give a beautiful girly touch. I love pink and grey together like this! I love to do simple tape manis like that! Really pretty! I love pink and gray combos.